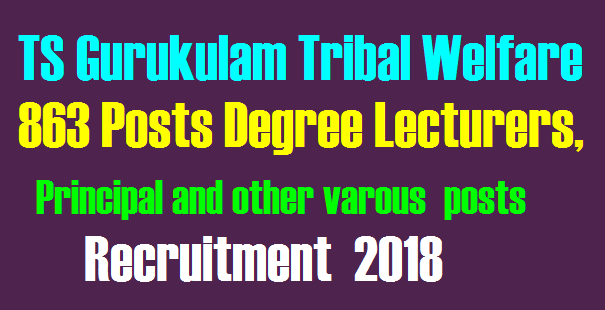 Telangana Degree Gurukulam Tribal Welfare Notification 2018 Degree Lecturer Principal 863 Posts TS Gurukulam Recruitment Notification 2018 Telangana Tribal Welfare Residential Educational Institutions Society (Gurukulam) (TTWREIS) by Direct Recruitment through the Telangana Residential Educational Institutions Recruitment Board (TREI-RB) . Filling up of eight hundred and sixty three (863) vacant posts in various categories in Degree Colleges under the control of Telangana Tribal Welfare Residential Educational Institutions Society (Gurukulam) (TTWREIS) by Direct Recruitment through the Telangana Residential Educational Institutions Recruitment Board (TREI-RB) – Orders – Issued. Public Services – Recruitment – Tribal Welfare Department - Filling up of eight hundred and sixty three (863) vacant posts in various categories in Degree Colleges under the control of Telangana Tribal Welfare Residential Educational Institutions Society (Gurukulam) (TTWREIS) by Direct Recruitment through the Telangana Residential Educational Institutions Recruitment Board (TREI-RB) – Orders – Issued. 1. G.O.Ms.No.22,Scheduled Caste Development (RS) Dept, dt:27-04-2018. 2. Tribal Welfare Dept, U.O.No.2709/TW.Bud&Edn/A1/2017, dt.19.06.2018. In the reference Second read above, the Tribal Welfare Department, have proposed to fill up (863) teaching and non-teaching posts in Telangana Tribal Welfare Residential Educational Institutions Society (Gurukulam) (TTWREIS). 2. Government have reviewed the Direct Recruitment vacancy position in Telangana Tribal Welfare Residential Educational Institutions Society (Gurukulam) (TTWREIS). After careful examination of the proposal furnished by the Department and keeping in view the actual requirement of manpower with reference to the nature of work and activities of the department and also the overall financial implications, Government hereby accord permission to fill up (863) eight hundred and sixty three vacant posts in various categories in Degree Colleges under the control of Telangana Tribal Welfare Residential Educational Institutions Society (Gurukulam) (TTWREIS) by direct recruitment through the Telangana Residential Educational Institutions Recruitment Board (TREI-RB) as shown above. 3. The Executive Officer, Telangana Residential Educational Institutions Recruitment Board (TREI-RB) is requested to take necessary steps for filling up of the above vacancies through direct recruitment by obtaining the details, such as local cadres of the vacancies as per the Presidential Order (zone / district etc., as applicable), roster points, qualifications, etc., from the concerned authorities and for issue of schedule for recruitment and notification by the Commission accordingly.